I was recently the guest of the Small Business Advisory radio network: SBA Radio. Very cool. They wanted to learn about my Laugh-O-Nomics theory and how I — as a motivational speaker — connect humor, levity and lightheartedness to bottom line results. I love being on the radio… it’s harder than it looks. But it went well and I had a blast. If you’re interested, you can hear what I did here. PS. In something totally unrelated, I updated my main page about my magician & comedian offerings. Check it! Or, interested in my corporate game show? Got it updated too! Here’s another one of my tips on how to be a motivational speaker. Today I talk about how to choose your topic. Questions? Leave them in a comment below and I’ll answer them in a video. 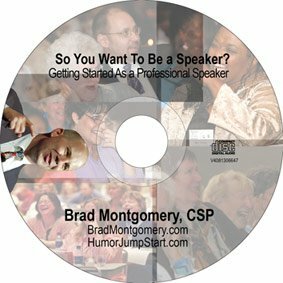 Learn more about how to be a motivational speaker with my audio here. Prefer to read the text? Hey, this is Brad Montgomery from BradMontgomery.com. Alright, so here’s the continuing saga, “How to Be a Motivational Speaker.” I promised you some tips, here comes another one. One of the big questions I get all the time is what am I going to talk about, what could I possibly talk about? Well, when you are picking the topic for your keynote, there’s a couple of things I want you to consider. First, if you’re going to be a professional speaker, not only do you have to be good, but you have to be passionate about something. So what is it that you are passionate about? You’re going to be talking and researching and marketing and everything, make sure it’s a topic that you actually love, which is my way of saying, if you think you want to speak on leadership or change or some whatever, I’m saying that’s fine, unless you don’t have passion for it. So, if you don’t, skip it, right now. The other thing too is make sure it’s something you’re an expert in. So, as you’re choosing your topic, what are you good at, what are you already an expert in right now? So for example, if you work in a hospital and you’re a genius about what’s going on with healthcare, maybe that’s your niche. Or if you know everything there is about energy or whatever or in my case, if you happen to know everything there is about humor at work, bingo, I’m your guy. See, I have passion about that; I’m an expert in it, that’s why it’s good for me. What are you going to find that’s good for you? So, to sum it up, when you’re becoming a motivational speaker, if you’re asking yourself how to be a motivational speaker and you’re wondering about your topic, first, find something you have passion in, second, find somewhere where you have some expertise. Alright, Brad Montgomery, BradMontgomery.com. More tips on how to be a motivational speaker soon. Thanks. 100 teachers. And by tear up I mean he was terrific… the audience loved him. Steve and I have been friends since high school — which is fun partly because I’ve seen him grow from just a talented guy to a famous talented guy. I stopped by to see one of his projects in person: he invites teachers to come to his Science in the Rockies program where he teaches them science tips and tricks, all backed by curriculum they’ll incorporate in the classroom. Sounds good to me. But seeing the smiles on these teachers faces AS they learned was a good reminder of the importance of engaging an audience. They weren’t sitting taking notes: they were actively participating, laughing, talking to each other and to Steve. It was a great reminder that people — even audiences — can multi-task. You might incorrectly connect a silent audience staring at the presenter with an audience that gives a darn. They might be deeply engaged…. or they might be quietly going over their shopping list in their heads. 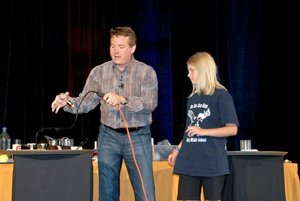 Steve calls it “hands-on science.” His audiences learn AND have fun. (And you can bet your bottom dollar that because they are having fun, they retain more.) But professional speakers of all types — motivational, funny, whatever! — can learn from this Colorado speaker. distractions are plentiful (iPhones, Blackberries, wireless in convention hotels) and ROI needs to be extremely high, nobody can afford to plop a mediocre speaker in front of an audience who just barely cares enough to sit there. Meeting planners demand results; results demand engagement. My point? If you need a speaker ask this question: What specific activities will you do to physically engage my audience, and how to you plan to connect that engagement to what I’m trying to accomplish at the meeting. Steve makes it work at his teacher boot camps; good speakers make it work in the corporate and association world. 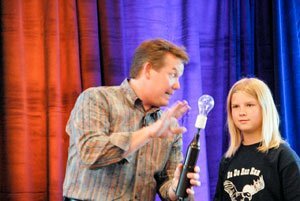 Need an engaging funny motivational speaker? Go to the contact page now.